Cruel and lustful Thakur Dayal Singh (Amjad Singh) brutally rapes Sarla (Nazneen), forcing her to commit suicide, leaving her young children, Vikram and Munna, homeless. Vikram and Munna try to stay together but are separated. Years later Vikram (Sanjeev Kumar) has taken to a life of crime with Ranvir, who unknown to Vikram, is none other than Thakur Dayal Singh. While assisting his friend, Peter (Paintal) to meet with his future wife, Ruby (Preeti Ganguly), Vikram meets with the ravishing Priya (Sulakshana Pandit), and both fall in love with each other. Meanwhile Munna finds a place in the home and heart of the devout and kind-hearted Sher Khan (Pran), who now calls him Amar Khan. 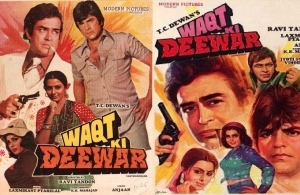 Amar (Jeetendra) grows up to a diligent Police Inspector. His duties lead him to meet many thieves and criminals, one of whom is the beautiful Soni (Neetu Singh). After a few misunderstandings both fall in love, and Soni pledges to give up her life of crime. Then one day, when Amar is being overwhelmed by a number of gangsters, Vikram comes to his help and both become good friends. This friendship does not last long as Amar soon starts to suspect Vikram. Will Vikram and Amar ever come to know of their true relationship? Will Ranvir be exposed as Thakur Dayal Singh?